Project Shadow Co. is pleased to announce the launch of the ‘ultimate lumen jacket’, the windbreaker of the next level. The ‘ultimate lumen jacket’ is super lightweight, weatherproof yet keeps the user dry with maximum visibility for safety, packed and ready for any occasions, and a fashion forward design for urban outdoors. Project Shadow Co. has already run a KickStarter campaign and based on the feedback from backers was able to re-design and upgrade their product. They added detachable patch with magnets to easily hold earphones , lined vents on the chest and back for the maximum airflow to keep the user maximum dry, invisible seam pocket with a larger 8 ½ inch opening on side seam to keep their essentials, cuff and hem finished with elastic for more comfort and flexibility. They also made the hood larger to give their customer extra coverage in harsh weather. In addition, the pockets are finished with water resistant zipper and frame weld to keep their belongings dry. The ‘ultimate lumen jacket’ comes with three different fabrics that feature different functions that add to all of the loaded features: the “Ghost”, the “Olympian” and the “Shadow”. The “Ghost” is made with special fabrics that absorbs the light and glows in the dark, while the “Olympian” has a full flash reflective membrane that includes all of the fully packed features. Last but not least, the “Shadow” has a full water repellent membrane on top of all the other features. 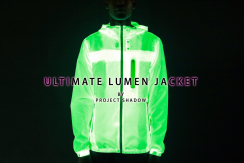 For further information and to claim your perk visit https://www.kickstarter.com/projects/projectshadowco/ultimate-lumen-jacket-coolest-and-safest-way-to-tr today. Project Shadow Co. is a promising startup based in Los Angeles, California. They aim at making clothes that “take your performance to the next level”.